In Defense of Communism: Evo Morales, Alexis Tsipras and... "revolutionary realism"
Evo Morales, Alexis Tsipras and... "revolutionary realism"
It was truly sad watching Bolivian President Evo Morales becoming part of Alexis Tsipras' propaganda just months before Greek elections. Because that is what Tsipras actually tried during Morales' visit in Athens two days ago. Having the President of Bolivia by his side and in front of Greek and foreign reporters, Tsipras engaged into an endless jabbering about the "common struggles of the progressive forces", talked about "democracy and social justice", the "21st century left", etc. Of course, as usual, Tsipras didn't say the truth. He didn't refer to the harsh anti-people, anti-workers policy of his government, didn't say a word about the additional austerity memorandums he himself signed, he silenced the fact that, just a few weeks ago, he was co-governing with the far-right ANEL party. 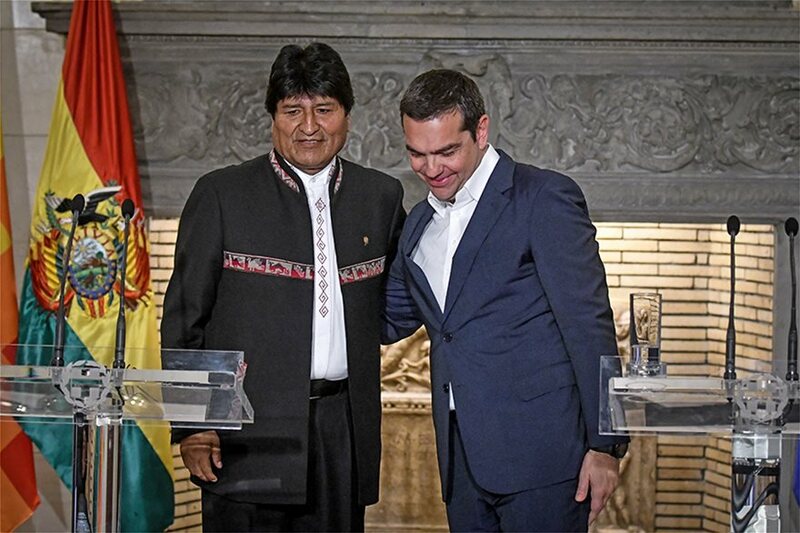 Alexis Tsipras exploited the fact that he had by his side Evo Morales, a highly respected figure within Latin American left who remains very popular within Bolivia's working class. He tried to use Morales' popularity in order to pose as a "left" and "progressive" leader. Speaking at "Stavros Niarchos" Foundation on Thursday, Tsipras engaged in a pseudo-socialist rhetoric about... "revolutionary realism" and the "governing left of the 21st century"! However, he didn't explain to President Morales and the audience: How "revolutionary realism" and the "21st century's left" are combined with loyalty to NATO and the USA? Does the "progressiveness" of SYRIZA goes hand by hand with the policy of serving the interests of the imperialists in the Balkans and Eastern Mediterranean? Mr Tsipras argued that the difference between a progressive and a neoliberal policy in taxation is that the neoliberal government aims to reduce taxes for the rich something that is disastrous for the majority of the people. Who said this? The Prime Minister whose government, just a few days ago, reduced the tax rate of the distributed profits of the shipowners from 15% to 10%! It was his government that, during the recent constitutional revision, denied the proposal of the Communist Party (KKE) to abolish the article which provides tax immunity to the - multimillionaire- shipowners! Once again Tsipras lied and, furthermore, he used President Morales in order to promote his domestic political agenda. The Greek Prime Minister and his party, SYRIZA, have nothing to do with the words "socialism" and "revolution". During the last four years, they proved what they are: Stooges of the big capital and the "best students" of the US-NATO-EU imperialists. This is why it was appalling hearing Evo Morales calling Tsipras a "brother" and praising his "job" in Greece. This is diplomacy, many will say. But even in diplomacy, keeping your dignity is an important matter.